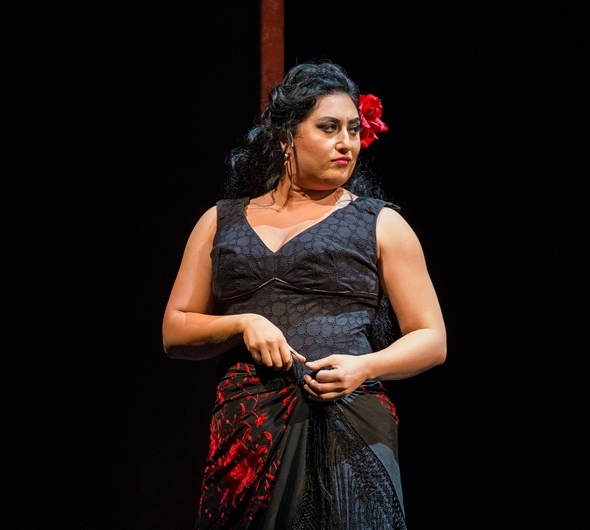 Lest any insatiable lover of Bizet’s opera “Carmen” be put off by the idea of a “second cast,” as the Lyric Opera of Chicago has now changed the leads in its continuing production, let me put this as plainly as possible: The mid-run advent of mezzo-soprano Anita Rachvelishvili in the title role, with tenor Brandon Jovanovich now portraying the tragically smitten Don José, isn’t just hot stuff; it is scorched earth. And you have two more chances to witness their potent illustration of just how great a theater piece “Carmen” really is, with final performances set for March 22 and March 25. Moreover, the new stars are companioned by a fresh conductor: the 38-year-old Latvian Ainārs Rubiķis, who looks like he might be barely out of his teens – I sat quite close this time – but leads with a musical authority that bears heeding in the seasons to come. 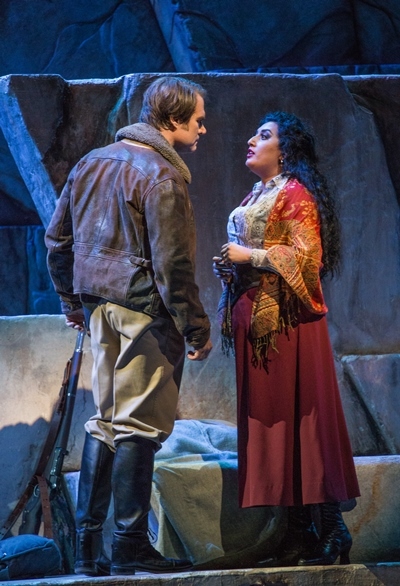 That pretty much sums up what Carmen does to the defenseless country boy Don José, who has not only a girl back home but also a doting mother who’s counting on his moral rectitude. Don José is doomed from the moment the amoral Carmen hurls her crimson flower – herself in blood-red petals – at him and quick as un-deux-trois seduces him into helping her elude imprisonment for carving up a friend’s face. It was a dramatic object lesson to watch Jovanovich make that progression from buttoned-up soldier to a lover in over his head, from good boy become brigand to a good man tragically destroyed. Simple as Don José may appear to be, his psychological struggle is as complicated as it is intense, and Jovanovich evinced that terrible conflict in affecting detail. He epitomized José’s failing resistance and certain doom in the single aria “La fleur que tu m’avais jetée,” which he delivered with an admixture of earnest sentiment and desperate yearning. The payoff, of course, must come in the final scene, when the ruined José, against all hope, confronts Carmen – now enamored of the celebrated bull-fighter Escamillo – with a raving final plea for one more chance. Jovanovich and Rachvelishvili were fire and ice, he blindly flailing at her steely indifference and she resigned to the death long since foretold by her tarot cards. You can’t take your eyes off either of them. 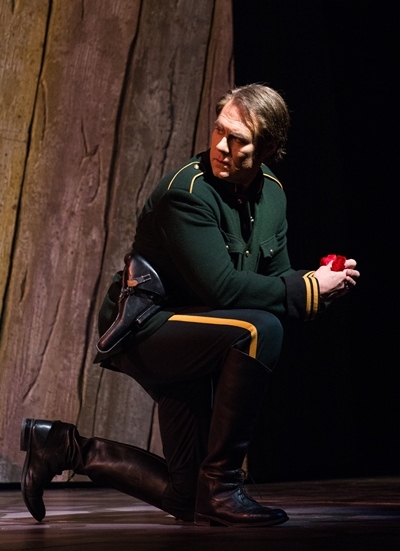 This is opera as resonant theater.